Community Ed Classes Make Great Gifts! Looking for a gift for the person who has everything? Need a companion gift to go with another item, or the perfect stocking stuffer? 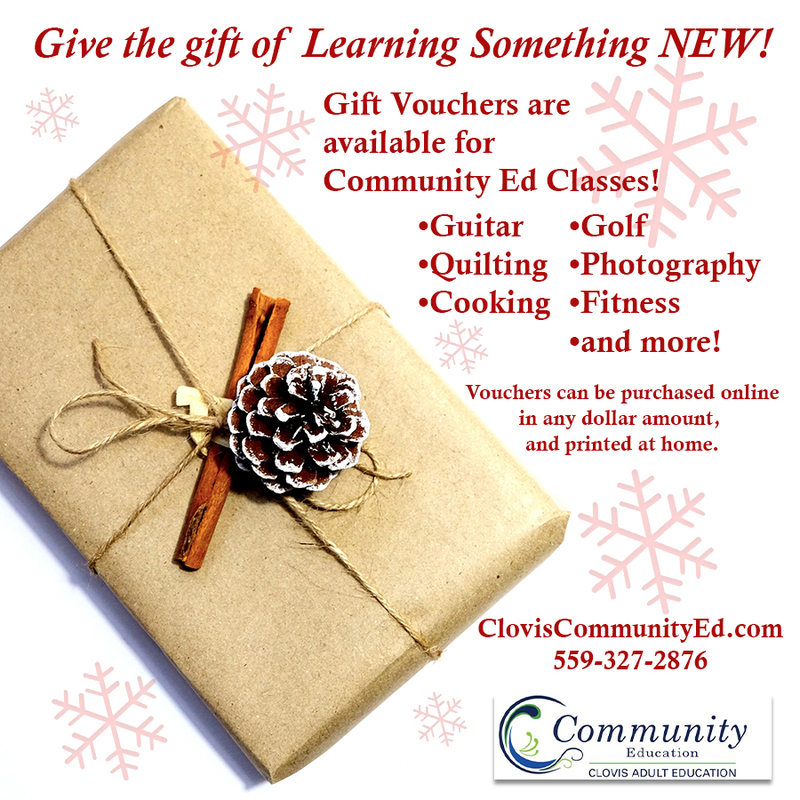 Why not give a Gift Voucher for Community Ed classes? We offer something for just about everyone on your list – Guitar/Bass lessons (new guitar under the tree? ), Sewing, Art, Photography (who’s getting a new camera?? 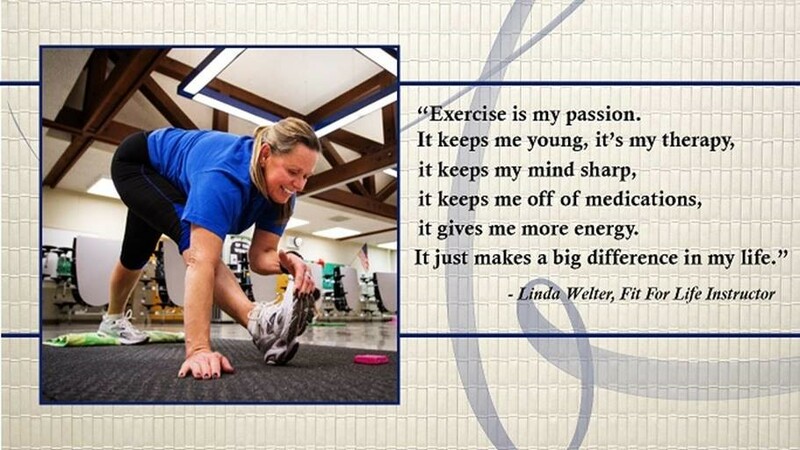 ), Golf, Fitness, Computers, Cooking, and so much more! Vouchers can be purchased on our website and printed at home – click click click and you’re done! Or, purchase by phone and print at home, or we can mail a physical voucher to you or the recipient. Questions, give us a call at 559-327-2876. Office hours next week are Monday – Thursday 8am-8pm, and Friday 8am-3pm (although the potential for getting to go home early on the last day are very high, just FYI! :)). Once again a section of our campus will be transformed into a gallery of all things Community Ed! 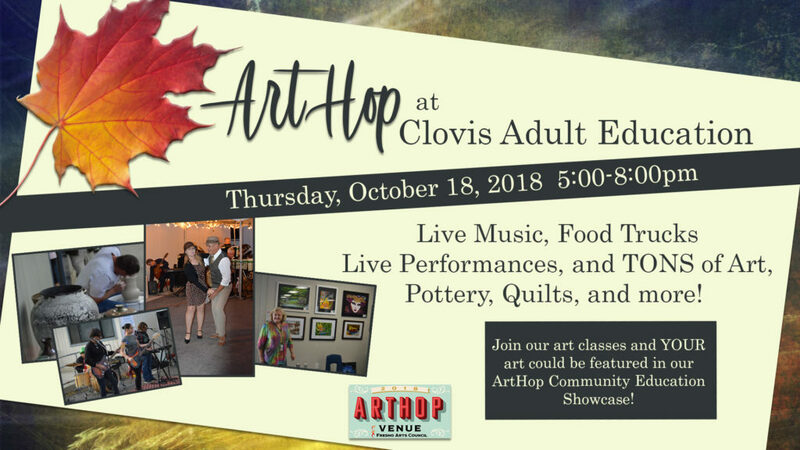 Thursday, October 18th from 5-8pm, come on down to view student and instructor paintings, photography, quilts, ceramics, live music, dance performances, bonsai demonstrations, face painting for the kids, food trucks for everyone, and more! It’s going to be a wonderful evening – don’t miss it! For full event details, visit the event on our Facebook page, and be sure to like our Community Ed page as well. You can also give us a call at 559-327-2876. 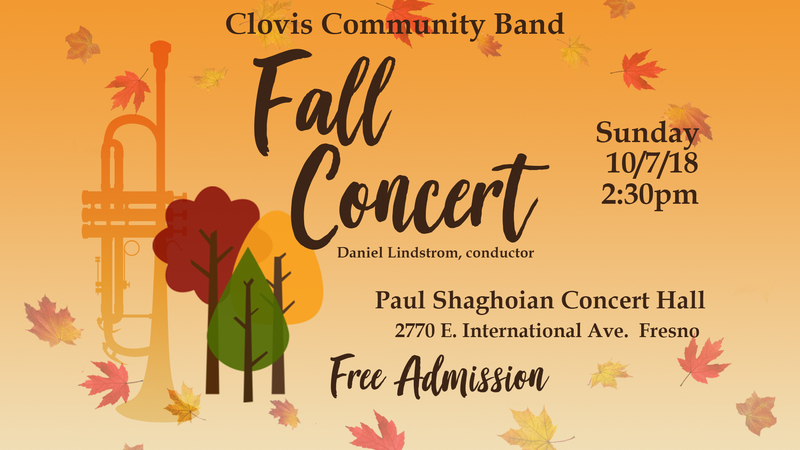 This Sunday – The Clovis Community Band presents their Fall Concert! This concert is FREE and will be held in the beautiful Paul Shaghoian Concert Hall on the Clovis North High School campus. The concert begins at 2:30pm – get there early to get a good seat. What a great way to spend a Sunday afternoon, listening to some wonderful live music from a 60+ member band, and it’s free! The Paul Shaghoian Concert Hall is located in the Performing Arts Center (the PAC) at Clovis North High School – 2770 E. International Ave. in Fresno, near Willow and International. Questions – give us a call in the Community Ed office at 559-327-2876. 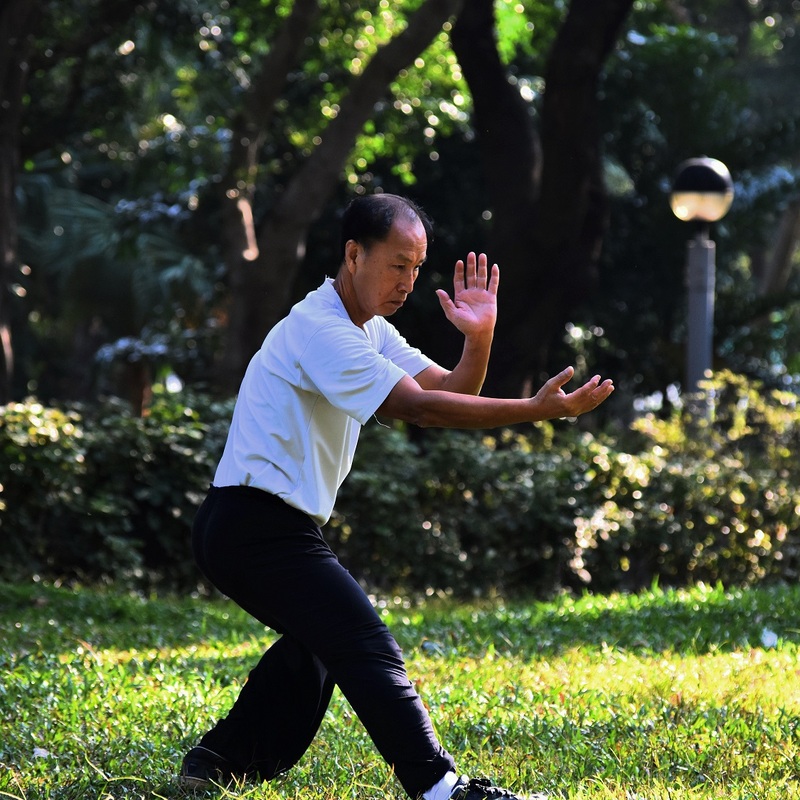 View all the details on our Facebook page under Events – stay up to date with all the information on our classes, as well as events! Microsoft Word – A Little More! If you know the basics of the Word program, but need a little more, this class is for you! This intermediate class will solve the mysteries of Word with tons of tips and tricks that will turn you into an advanced Word user. 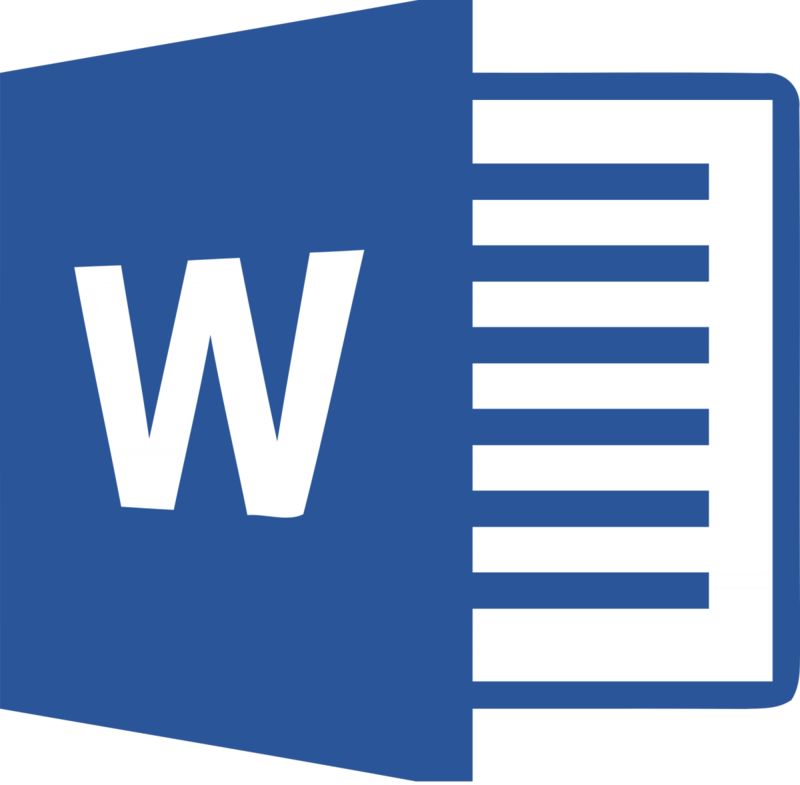 Learn more about shortcut tools, formatting multiple page documents, using reference tools and integrating with other programs. Get hand-on training in our computer labs from our expert, patient and helpful instructor! Class meets T/Th 10/2-10/11 from 6:00-9:00pm, cost is $139. Register today! Sign up on our website, by phone at 559-327-2876, or stop by the Community Ed office on the Clovis Adult Education campus, located at 1452 David E. Cook Way in Clovis, near the corner of Herndon and Sunnyside. Learn Something New about the Word program with Clovis Community Ed!